Another Kind of Blue tickets for the Peacock Theatre run available now from £22! Dance troupe Another Kind of Blue blew the judges away when they first appeared on Britain's Got Talent back in 2016. In fact, so impressive was their audition on the show that they received a standing ovation. Yet many audiences were outraged that they did not receive the prestigious golden buzzer. Their stunning first performance, which then featured Netherlands dancer Violet and Italian dance Nino (Antonino), took them all the way to the show's finals. Now the dance troupe is heading to the capital this July to show London audiences why they deserved the golden buzzer. As of September 2017, Another Kind of Blue has six members. Nino from Britain's Got Talent remained with the group while Violet left. The remaining five members include Demi-Carlin Aarts from The Netherlands, Jeroen van Acker from Belgium, Corinne Cilia from Italy, Klevis Elmazaj from Albania, and Faiza Grootens from The Netherlands. Cutting-edge drones meet modern dance in the spectacular new show by Britain's Got Talent finalists Another Kind of Blue. Flirt With Reality does exactly what the title of the show suggests, exploring the boundaries of reality and our natural world and how they have merged with our ever-so virtual world. 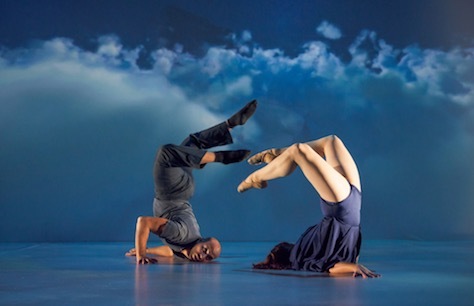 The Another Kind of Blue's dancers will literally converge and collide with drones and digital matter in a fantastical dreamscape that appears to defy gravity and will leave you mesmerised by its imaginative rhythm and visual splendour. Cheap Another Kind of Blue London tickets! Be among the first to book tickets for Another Kind of Blue: Flirt With Reality at the Peacock Theatre. Secure your seats now for the best prices and enjoy the show this summer!